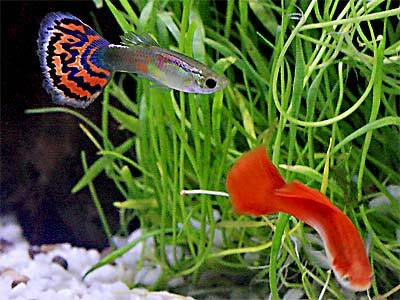 Fancy Guppies are the best known and most popular aquarium fish--and no two look the same! Something to be wary of with this species is stock quality. Mass produced stock of low quality is likely to be disease-ridden. These fish are, unfortunately, rather prone to fungal infections, which can easily damage the tissue of the Guppy's large tail. Another problem related to the stock quality is that some of the fanciest true-breeding strains of guppies will be highly inbred. This leads to genetic weaknesses that can also decrease hardiness and resistance. Guppies are fun and great to own. They come in all sorts of colors and are easy to care for and breed. Social Grouping: Groups - Though not a schooling fish, they will often shoal in the wild, depending on the amount of predation. Colors play an important role in selective breeding. These fish start with a ground color (main upper body color) that is marked with a "cover" (primarily on the lower body) of bright iridescent colorings and patterns. There are 4 basic ground colors (wild-color, albino, blond, and blue) as well as a number of other ground colors developed with combinations of those four. The cover can be any imaginable color or combination of colors and have a variety of different names. Some pattern examples are snakeskin (rosette, chain-link pattern), carpet, cobra (rosette pattern with vertical bars), and black (called "tux" or "half-blacks"). Size of fish - inches: 2.4 inches (5.99 cm) - Females are about twice the size of the males. Although the common length is only about 1.1" (2.8 cm), captive guppies can grow larger. Lifespan: 2 years - On average these fish will live about 2 years, both in the wild and in captivity, but well cared for captive specimens can live even longer, up to about 3 years. Aquarium Hardiness: Very Hardy - Guppies are very durable, but there is a disparity in the quality of available stock. Additionally, their extensive finnage is susceptible to damage and resulting infection. Feeding Frequency: Several feedings per day - Feed small amounts several times a day. Portion size should be what the fish can consume in about 3 minutes. Water Changes: Bi-weekly - Do water changes of 25% every 2-3 weeks, or more often for heavily-stocked tanks. Minimum Tank Size: 5 gal (19 L) - A trio can be kept in a 5 gallon (18 Liters) tank, but keeping mixed sexes will result in breeding and quickly increase the population, necessitating a larger tank. Lighting Needs: Moderate - normal lighting - This fish tolerates low to high lighting, although excessively high lighting from above tends to wash out their coloration. Brackish: No - This is not a brackish water fish, but it does appreciate a little salt in the water--about 1-1.25 teaspoon per gallon of water. Water Movement: Weak - Water movement should be weak to moderate. Water Region: All - The Guppy swims in all levels of the aquarium. Temperament: Peaceful - This is an excellent community fish and mixes well with most other small, peaceful fish. The exception to this is the Betta fish, which will either suffer fin nipping by the guppy or mistake guppies for another Betta and attack. In either case, this combination does not usually end well. Same species - conspecifics: Yes - They are tolerant of juveniles, but they will chase and eat newborn fry. Monitor the fish closely when she is close to giving live birth. Guppies will chase their fry and may eat them if given a chance. The young will be consumed unless they are removed, isolated as with a breeding trap for example, or simply given enough hiding spaces such as dense rooted or floating plants. The broods can be up to 100 fry, and the female can produce young again in about four to eight weeks. For more information, see the guide for breeding Livebearing Fish: Breeding Freshwater Fish - Livebearers. Anything you add to your tank can introduce disease. Not only other fish, but plants, substrate, and decorations can harbor bacteria. Take great care and make sure to properly clean or quarantine anything that you add to an established tank so as not to upset the balance. For information about fish diseases and illnesses, see Aquarium Fish Diseases and Treatments. My guppy had babies and i don't really know what to do!!! I can only see 2 guppy fry swimming in the tank and I have an extra 1 gallon bowl but I don't want to stress the babies out. Please help!!! You should remove the babies. Guppies don't make very good mothers and they have a strong tendency to assume the babies are food and will eat them. Good luck. Really depends on how much decor. 30 or so should be fine. But remember these fish breed often and a lot! So be prepared for the population to grow. My guppies won't stop breeding, soon the tank will be completely filled with guppies! I mean the babies are beautiful but 1000000000 guppies is not! I bet your local fish store would take any extra Guppies you have. the prob is they are all midgets, the males only grow to a centimeter and they got sick after taking a 10 minute drive (i live on the mountain about 45 minutes away from any pet shops). I have three male guppies in my tank and they are lovely beautiful fish. They don't bother any other fish in my tank and can someone tell me why one of my guppies goes to the bottom of the tank every night to sleep and when he wakes up he doesn't look good and then after eats fine and swims perfectly like they should. But they are lovely fish to keep so I recommend you get some.